Distinctive, highly aerial wader, resembling terns in graceful fast flight, long pointed wings, deeply forked tail and short bill. Usually in loose flocks chasing winged insects. On ground, plover-like with quick tripping actions on rather short legs, often with upright stance, head held high. 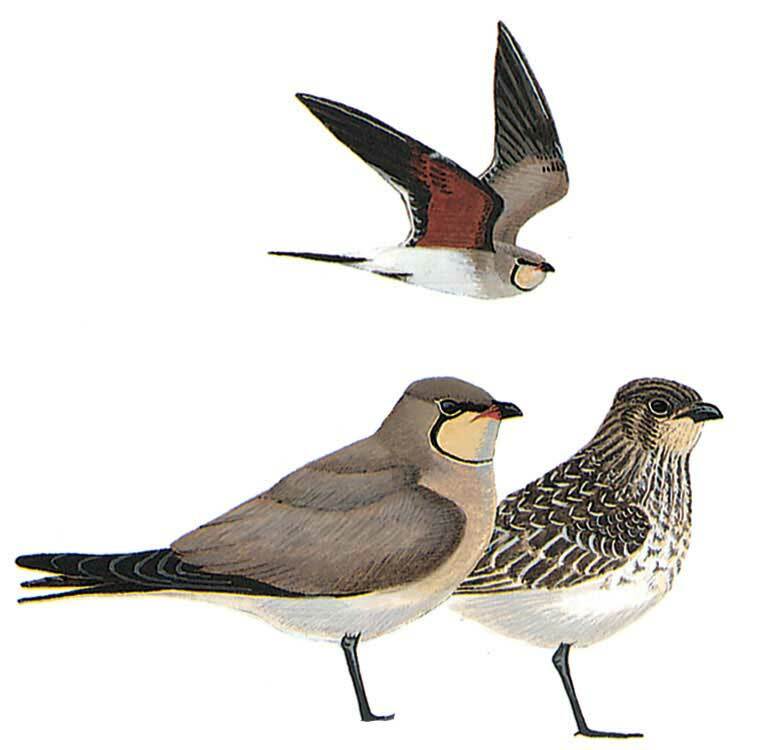 Adult has creamy buff throat bordered black; tail and wing-tips are equal; in flight, uniform dark olive-brown above (slightly darker flight-feathers) with narrow, but distinctly while trailing edge to secondaries, contrastingly, white rump and belly; underwing-coverts reddish brown, but often look shadowy black. Black-winged Pratincole (which see) has generally darker upperparts. lacks white trailing edge to wings, and has black underwing-coverts. Adult non-breeding and juvenile lack distinct black throat line, and juvenile brown feathers have pale tips and fringes; outer tail-feathers are shorter than in adult.